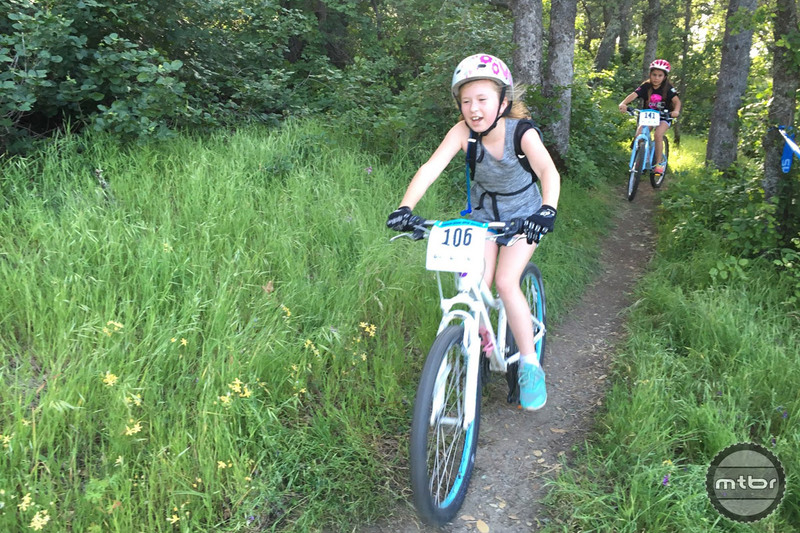 Grom girls racing the singletrack in the trees (click to enlarge). 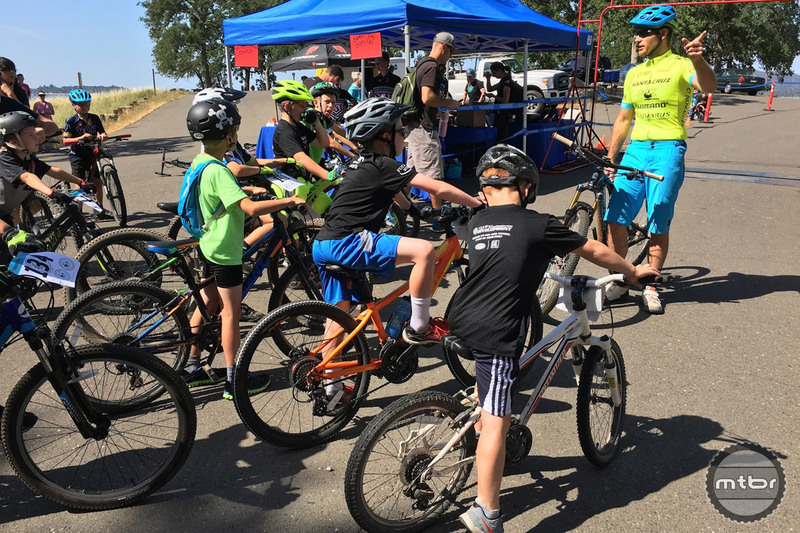 Last fall, my wife Jen and I were given the reins to a small operation putting on mountain bike events for middle school aged kids in Folsom, California. 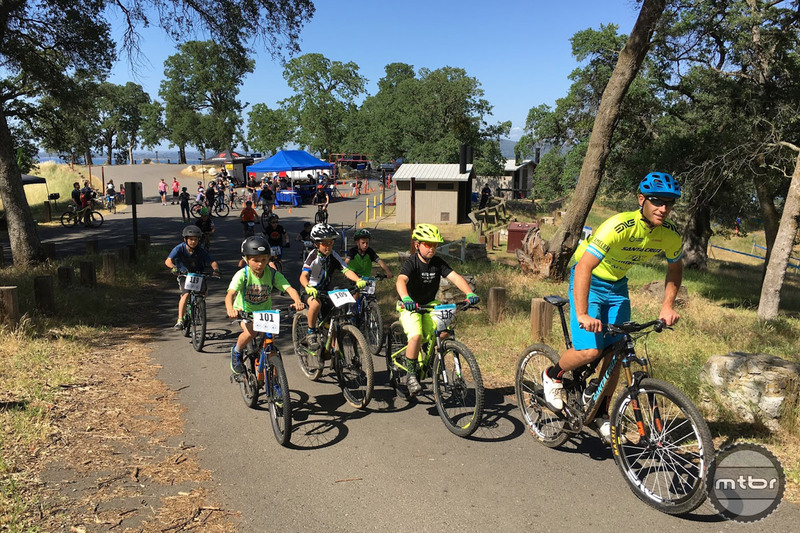 It really opened our eyes to a need for quality experiences for young kids who rarely get to race bikes on courses designed for them — without being mixed in with adults. So we started brainstorming how to best format events for kids, and what would be the real goal. Because neither of us believe that 8-14 year olds should solely be focused on competing, winning, and/or getting prizes. Instead the real opportunity is the positive experience that comes from competing with others and giving your all. The goal we landed on was to provide an opportunity for youth mountain bikers to learn how to race in a safe, fun environment. It sounds simple but executing those key terms effectively was not easy. We put our own stamp on it with a new name, website and a fresh venue. 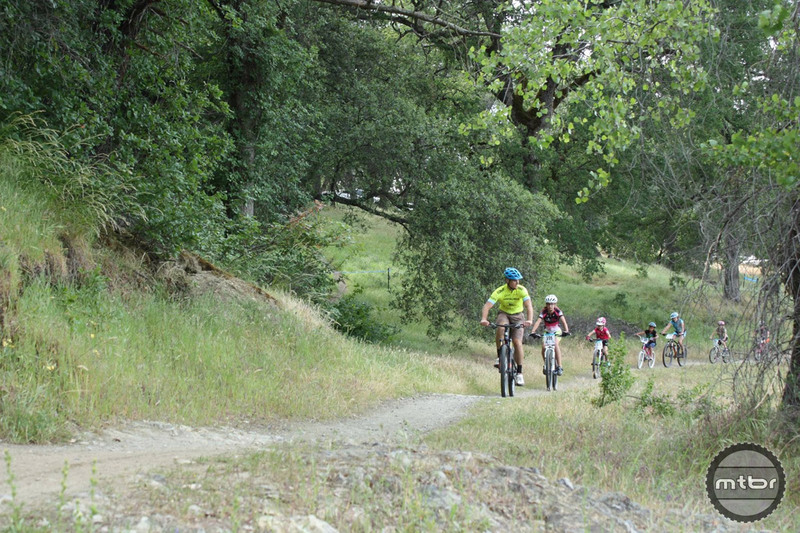 The Folsom Grom MTB Series was born. I set up three short track courses on Friday nights at Folsom Point on the south shore of Folsom Lake. This provided a nice place for families to hang out and parents to see their kids almost all the way around the course. Each category would race for 25 minutes on the small course ticking off as many laps as possible. And since we wanted to recognize each racer for their accomplishment regardless of placing, they would receive a small helmet sticker (think college football helmet badges) for each lap completed. The top 10 would also get a rank sticker to put on their number plate, making that a series trophy as well. Before each category start, I held a pre-race meeting to make sure everyone understood the format and racing basics, then we’d lead them out around a lap and walk them through the features. The pre-race meeting with the 8-10 boys (click to enlarge). The first week’s course was just over a half mile and after leading the group of 8-10 year old boys, they were stoked and excited to race. We were actually caught by surprise with how many laps they did, with the lead group cranking out 8. They were executing water bottle handoffs with their parents on the climb and really getting into it. The girls even showed up in numbers and were shredding it, too. It was awesome. Leading out the 8-10 boys on their first scouting lap (click to enlarge). Week No. 2 featured a slightly little longer course (0.65 miles) and had one steep descent. There were a couple kids who weren’t quite up for it after their pre-lap, but we took advantage of our scout lap refund policy. Most of the kids were very excited, and thought it was cool to have a different course. We had our biggest turnout of the series, with a really good showing from the girls. Leading the Grom girls out for their week two scouting lap (click to enlarge). At one point in the girls race, there was a crash right at the start/finish line. Two girls seemed to clip bars and both went down. They both got up, but were panicked and shaken. I helped rotate one girls handlebars back in place and she rode off. And the other had hit her knee pretty hard and was working through it, crying, trying to shake it off. Her Mom was there, asking if she wanted to stop and that would be ok. But she, still crying, said no and swung her leg over and kept going to finish the race. It was really cool to see, since that’s the type of determination that will go way beyond cycling. Another girl had dropped her chain half way through the lap and ran the rest of the lap with her bike until her Dad could fix it. They didn’t quit when it got hard and finished what they started, truly giving their best under adversity. It’s one of the main experiences and learning opportunities we wanted to give kids with these races. Thanks for putting this on Clint! Format was great, 5-10 laps means we get to cheer our kids on, and very good for non-biking specators to see what it is all about. My kid had a blast.